Back in the 1980s, Snickers had a memorable ad campaign with the jingle, "Snickers really satisfies you." 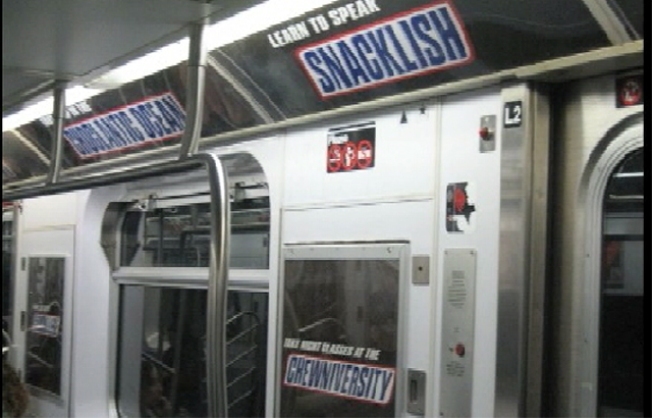 Well, our hunger for cheesy ads was satisfied by this New York-centric ad campaign for Snickers chocolate bars down in the subway system. One ad advises straphangers to "Enroll at ChocoCollege." That's a sweet twist of course, on City College. Another one, and it's by far our favorite, pays homage to Dr. Jonathan Zizmor, easily the king of subway advertising with his ubiquitous ads for his East Side dermatology business. In the Snickers ad, we are advised that we can "Schedule a consulation with Dr. Feedzmore." We love any campaign that wittily references the ads that sit right around it. And it seems most subway ads are for services such as those provided by Dr. Z, (we don't even want to talk about those foot-care ads) and the never-ending supply of colleges, institutes and universities promising a better future once you enroll. The Snickers campaign has one thing in common with one of its muses, Dr. Zizmore: It's memorable and breaks through the ad clutter. Hey, we're talking about it.